On Friday 1 March we were very pleased to welcome 61 students into the BOptom programme. 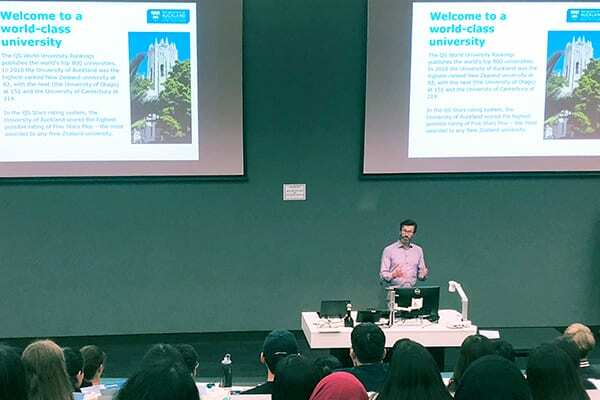 Orientation Day commenced with activities led by the NZ Optometry Students Society (NZOSS) and continued with a lunch arranged by the NZOSS and sponsored by the School of Optometry and Vision Science. An information session led by the school followed, which included a welcome by Head of School Professor Steven Dakin, overviews of what to expect in the programme from the Academic Director Andrew Collins and Part II Coordinator Monica Acosta, and a few words by Part III and Part V students. Further information on operational and support matters was provided by a range of other staff before the day concluded with a tour of the clinic, pre-clinic teaching suite, and school reception area led by a mixture of staff and fellow students.